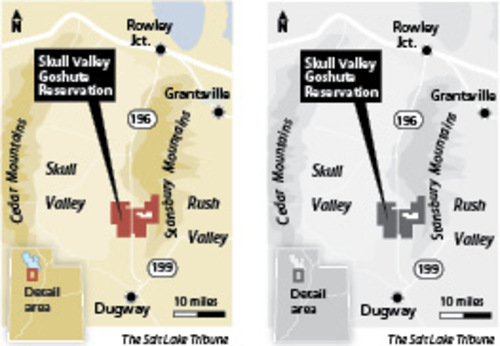 The Skull Valley Band of Goshute is one of the two bands of the Goshute Nation, the other being the Confederated Tribes of the Goshute. The band has a reservation of 17,920 acres in Tooele County, at Skull Valley, Utah, and their membership is 127. White settlement began in the 1850s with the arrival of the Mormons, leading to conflict and federal government efforts to remove the Goshute Indians. They failed in their attempts and it was not until 1912 that the Skull Creek Reservation was formed. Although this ensured the Goshute ownership of their own land, their way of life was changed when federal agents promoted agriculture, a large change from their usual efficient use of wild plants. The harsh desert land could not support this change, and since then the Goshute have turned to other sources of economic opportunity. In 1976 the Skull Valley Band built a rocket motor testing facility, which it leases to Hercules, Inc. They also pursued the development of storage facility for spent nuclear power plant fuel rods, however it was unsuccessful.